Finally, after comparing a few different programs, I chose Duplicity. Duplicity is an opensource software, that uses the rsync algorithm so only the changed parts of files are sent to the archive when doing an incremental backup. It also implements a number of transfer protocols/file servers such as: FTP, SCP, SSH, WebDAV, IMAP, Google Drive, Tahoe-LAFS, Amazon S3, Backblaze B2 and much more. But, let’s return to the beginning. You can specify if Duplicity should use full or incremental backup. Otherwise the program will choose a better way by itself. --encrypt-key [key-id] id of GPG key. The key-id can be given in any of the formats supported by GnuPG. In the above example duplicity restore only file from location /some/path/subdir/file. Firstly log in to your AWS console. 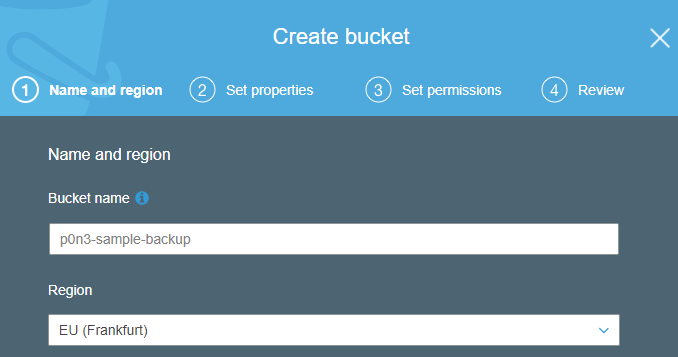 Go to Storage > S3 and create new bucket. Duplicity can also create new bucket, but if you do it yourself you can choose whatever region you want. Next, you should create individual account to isolate access to your account. Go to Security, Identity & Compliance > IAM. Click on Users, and choose Add user button. 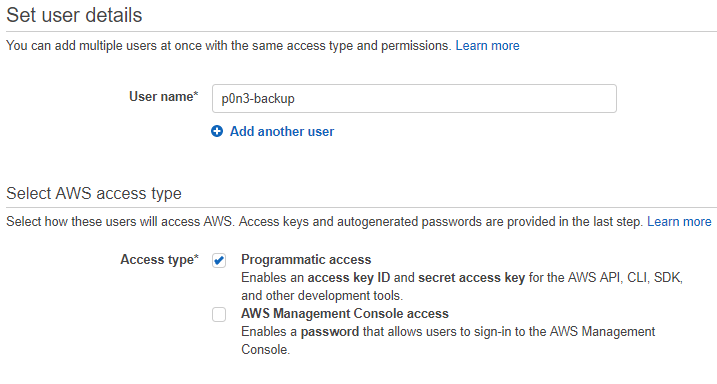 Type user name and set the AWS Access type to Programmatic access only. On the next step, attach existing policies directly choosing e.g. AmazonS3FullAccess. Check the whole settings on review and go to the last step. After you successfully created the user you can view and download user security credentials (Access key ID and Secret access key). Remember: if you lose your passphrase or key file then you lose access to your backups. So it is important to export/backup your key (use gpg --export-secret-key command). If you change something in /home/sample/* files, and run command again, you see that duplicity uses now incremental backup. I wanted to use several backup configuration, so my script has 2 parameters. First for backup name, and second for file/folder to restore. Second parameter is optional (in that case i want to restore entire backup). You can add an entry to the /etc/crontab or add script to /etc/cron.daily. However I prefer to use separate file in /etc/cron.d. Let’s assume that you have 3 backup configurations. It should run at 1:10, 1:20 and 2:20 everyday. And that’s it. Duplicity is extremely easy to use. After a few minutes of configuration you have a daily backup and you can restore any file when you want. By the way: I strongly recommend to export/backup bash scripts that you wrote in case of emergency.